Are you ready to get your learning on about the Diffusion of Pulmonary Gases? I sure hope so, because that is what this study guide is all about. 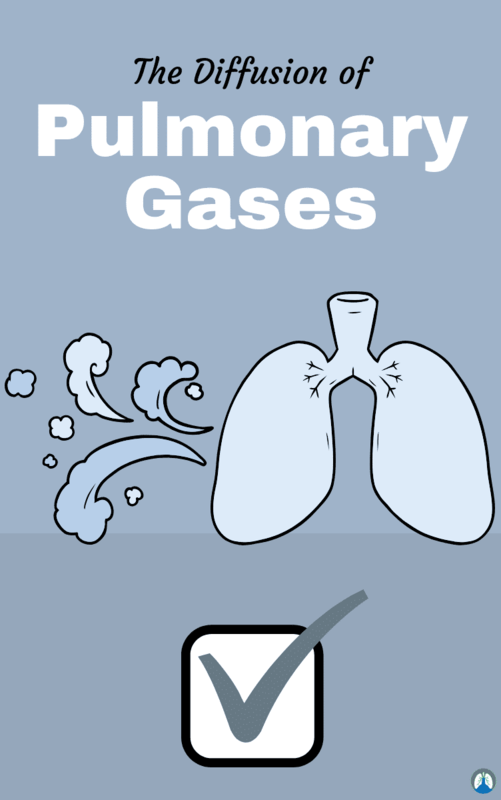 As you will see below, we have listed out a ton of helpful practice questions that can teach you everything you need to know about pulmonary gas diffusion. This is a topic that you will definitely see (and need to know) for your Cardio A&P classes in Respiratory Therapy school. That is why you might as well develop a good understanding of this topic now, because you will reference throughout your career as a Respiratory Therapist. Let’s go ahead and dive right in! 1. What is the barometric pressure on earth’s surface? 2. What will happen to barometric pressure when altitude increases? 3. What will happen to the barometric pressure when altitude decreases? 4. What causes gas to move in and out of the lungs? 5. What causes an individual gas to cross the alveolar-capillary membrane? 6. What is Dalton’s law? The law of partial pressure which is the total pressure is equal to the sum of the partial pressure of each separate gas. 7. What gases are in the atmosphere? Nitrogen, oxygen, carbon dioxide, water vapor, and trace gases. 8. How do you calculate the partial pressure for each gas? Barometric pressure X the percentage of the gas in the atmosphere. 9. What law states that the rate of gas transfer across a sheet of tissue is directly proportional to the surface area of the tissue, to the diffusion constants, and to the difference in partial pressure of the gas between the two sides of the tissue, and is inversely proportional to the thickness of the tissue? 10. What law states that the rate of diffusion of gas through a liquid is directly proportional to the solubility coefficient of the gas and indirectly proportional to the square root of the gram-molecular weight of the gas? 11. What law states that the amount of a gas that dissolves in a liquid at a given temp is proportional to the partial pressure of the gas? 12. What term defines that the transfer of a gas across the alveolar wall is a function of the amount of blood that flows past the alveoli? 13. What term defines that the movement of gas across the alveolar wall is a function of the integrity of the alveolar-capillary membrane itself? 14. Why is the PaO2 different than the atmospheric O2? Because when air is inhaled, by the time the molecules reach the alveoli, they are diluted by the addition of CO2 and H2O molecules. 15. What law uses this equation (Ptotal = P1+P2+P3)? 16. What law uses this equation (PAO2 = [Pb – PH2O] X FiO2 – PaCO2 X (1.25))? 17. What law uses this equation (V gas = [AD (P1 – P2)]/T)? 18. What is referred to as partial pressure? 19. The movement of gas from an area of high pressure (high concentration) to an area of low pressure (low concentration)? 20. What is the movement of individual gas molecules from an area of high pressure to an area of low pressure? 21. At what body temperature is the gas in the alveoli fully saturated? 22. Why is the partial pressure of oxygen in the atmosphere higher than the partial pressure of oxygen in the alveoli? Because alveolar oxygen must mix or compete with alveolar CO2 pressure and alveolar water vapor pressure which are not as high in the atmosphere. 23. How much water vapor pressure is exerted in the lung? 24. What is the ideal alveolar gas equation? 25. How do you get the respiratory exchange ratio? 26. What is the normal respiratory exchange ratio? 27. What are the layers that CO2 and O2 must go through? basal capillary membrane, capillary epithelium, and RBC. 28. How to calculate the difference between alveolar and arterial oxygen gradients? 29. Why calculate the difference between the alveoli and the blood? Because it helps identify problems associated with the A-C capillary membrane. 30. What are the normal gradients? 32. What law is the amount of gas that diffuses from one point to another by exchange? 33. What cells are the most important and needs to get enough oxygen and complex sugars? Brain cells and myocardial cells. 34. How many seconds do red blood cells get exposed at rest? 35. What is the significance of Henry’s and Graham’s Laws as it relates to O2-CO2 exchange? CO2 diffuses about 20x faster than O2. 36. Which law says that CO2 is 24x more soluble than oxygen? 37. Which law says that oxygen is lighter thereby it diffuses 1.7x faster than CO2? 38. What variables change in the alveolar air equation in Denver altitude 5500 ft? 39. Which is an application of Boyles law in these examples? Nitrogen washout, a boiling pot, oxygen cylinder is heated, normal breathing aka body, plethysmograph, and normal breathing. 40. What is the atmospheric gas typically has the greatest partial pressure in the alveolus breathing room air? 41. What the FiO2 at 30,000 ft? 42. What does the ‘a’ in PaO2 stand for? 43. What does the ‘A’ in PAO2 stand for? 44. Which gas has a greater pressure gradient between the alveolus and pulmonary capillary blood flow? Oxygen has a greater gradient than CO2. 45. What is the Fick’s law equation? 46. What is normal gas equilibrium met in the capillary transit time? 47. Which has an easier access for both carbon dioxide and oxygen to go through the alveolar-capillary membrane? 48. What is perfusion-limited referring to? It is referring to how much blood flow is going though the alveolar-capillary membrane. 49. What is normal alveolar water vapor pressure? 50. What is the normal alveolar CO2 pressure? 51. What is the normal atmospheric pressure? 52. What is the solubility coefficient of oxygen at 37 C and 760 mmHg? 53. What is the solubility coefficient of carbon dioxide at 37 C and 760 mmHg? 54. What is the normal transit time for blood through the alveolar-capillary system? The movement of gases across the alveolar capillary membrane. 56. What are the gases in the earth’s atmosphere? Oxygen, nitrogen, carbon dioxide, and other miscellaneous gases. 57. What is a pressure gradient? Movement of gas from a high pressure to a low pressure. 58. What is gas diffusion? Movement of individual gas molecules from high pressure to low pressure. 59. What is a diffusion gradient? Individual gas partial pressure differences. 60. What is kinetic energy? The driving force responsible for diffusion. 61. What is the diffusion of O2 and CO2? We breathe in oxygen to the alveoli, it diffuses into capillary membranes to blood/CO2 come from blood to the lungs, then to the atmosphere. 62. What is the thickness of lungs that must diffuse through alveolar-capillary membrane? 63. What does diffusion do if alveolar oxygen pressure decreases? 64. What is Henry’s law? Carbon dioxide is more soluble than oxygen. 65. What is the meaning of perfusion-limited? Transfer of gas across the alveolar wall, a function of blood that passes the alveoli. 66. What is the meaning of diffusion-limited? The movement of gas across the alveolar wall is a function of the integrity of the alveolar-capillary membrane itself. 67. What test is done to measure diffusion capacity? 68. What are the pulmonary disorders that increase the alveolar-capillary thickness? Pulmonary edema, pneumonia, interstitial lung diseases, acute respiratory distress syndrome (ARDS) and RDS in Newborn Infants. 69. How does oxygen and carbon dioxide diffuse across the alveolar-capillary membrane? Oxygen molecules diffuse across the alveolar-capillary membrane into the blood while the carbon dioxide molecules diffuse out of the capillary blood and into the alveoli. This will continue until equilibrium is reached. 70. What are pressure gradients? The movement of gas from an area of high pressure (high concentration) to an area of low pressure (low concentration). 71. What is gas diffusion? The Process of respiration is the movement of gases across the alveolar capillary membrane (AC – membrane). 72. What are diffusion gradients? It is an individual gas partial pressure difference. They help move gas across the alveolar-capillary (AC) membrane. 73. What are all the gases in the earth’s atmosphere? Nitrogen (NO2), oxygen (O2), carbon dioxide and other trace gases (e.g., argon). 74. Depending on the surrounding temperature and pressure, water can exist as what? 75. What do you call the water in the gaseous form? Water vapor or molecular water. 76. What is the absolute humidity of the alveolar gas? 77. What is the process of diffusion? Passive movement of gas molecules from an area of high partial pressure to an area of low partial pressure until both areas are equal and pressure. 78. How long does it take the blood move through the alveolar-capillary membrane under normal resting conditions? 79. In the presence of certain pulmonary diseases, the time available to achieve oxygen equilibrium in the alveolar-capillary system may not be adequate. Such diseases include what? Pulmonary edema, pneumonia (alveolar consolidation), and interstitial lung diseases. 80. When can oxygen toxicity develop? Within 24 hours in response to high partial pressures of inspired oxygen (PO2), and with longer exposure times to inspired oxygen concentrations (FIO2) above 0.50. 81. What is Henry’s law? The amount of a gas that dissolves in a liquid at a given temperature is a proportional to the partial pressure of the gas. 82. What is the rate of diffusion of a gas to a liquid in Graham’s law? Directly proportional to the solubility coefficient of the gas. And indirectly proportional to the square root of the gram-molecular weight (GMW of the gas. Breaks down the walls of adjacent alveoli and pulmonary capillaries, the alveoli merge together into a large air sac which is called bullae. Thus, destroying both the alveoli and pulmonary capillaries and decreasing surface area. 84. What is the meaning of perfusion-limited? The transfer of gas across the alveolar wall is a function of the amount of blood that flows past alveoli. 85. What is the meaning of diffusion-limited? The movement of a gas across the alveolar wall is a function of the integrity of the alveolar-capillary membrane itself. 86. What is the partial pressure of oxygen assuming a normal barometric pressure of 760 mmHg, if the percentage of oxygen is 0.4? 87. How many feet below sea level must an individual descend to exert a total pressure on the body of 3 atmospheres (2280 mmHg)? 88. Which of the following gas laws states that in a mixture of gases the total pressure is equal to the sum of the partial pressure of each gas? 89. What is the normal percentage of carbon dioxide in the atmosphere at sea level? 90. What is the alveolar water vapor pressure at sea level? 91. What is the patient’s alveolar oxygen tension if he is receiving an Fio2 of 0.60 on a day when the barometric pressure is 725 mmHg, and if the Paco2 is 50 torr? 92. What is the normal transit time for blood within the alveolar-capillary system? 93. What law states that the rate of gas diffusion is inversely proportional to the weight of the gas? 94. What is gas diffusion according to Fick’s law? Directly proportional to the difference in partial pressure of the gas between the two sides. 95. What is kinetic energy? It is driving force responsible for diffusion. So there you have it. That wraps up our study guide about the Diffusion of Pulmonary Gases. I hope that these practice questions were able to help you develop a better understanding of this topic. I know that if you truly know and understand this information, it will definitely help you down the road. Thanks for reading and I wish you the best of luck! Breathe easy, my friend.